As we approach the end of a long and complex year, and a turbulent election that saw a change of power in the House, it seems an appropriate time to hit pause and contemplate an approach toward a long-term global strategy for our country. We live in a highly tactical age, one that often seems categorized by the old saying, “the carnival moves on.” We seemingly have lost the collective ability to stop and consider where America needs to set its course. Strategy is actually simple: it is the rationalization of ends, ways and means. But in today’s America, we have extreme difficulty staying focused on a single set of ends (what we want to accomplish); ways (how do we accomplish our goals? ); and means (how do we pay for it?). Having spent a lifetime studying, developing and executing strategy, I have come to understand that simpler and shorter are better. Here I offer you a brief teaser on what our global strategy should encompass. All strategy must be understood and executed in a context, and the outlines of the global situation faced by the US are at once daunting and promising. On the dangerous side of the curve, we see the rise of an increasingly nationalistic China; a resurgent but fundamentally weak Russia; centrifugal forces pulling apart our greatest pool of partners in Europe; a lack of progress in much of Africa and Latin America; a Middle East in complete turmoil; a distressing deterioration of the global natural environment, especially the oceans; rising levels of cyber-insecurity; potential pandemics; growing numbers of authoritarian regimes; and a surge in international criminal activity -- from human trafficking to weapons to narcotics. But these negatives are balanced by what is going surprisingly well: startling improvements in biotechnology; advances in artificial intelligence and machine learning; better agricultural production; the rise of India, a huge and potentially powerful democracy; increasing engagement of women in the workplace and leadership roles; the resilience of democracy and institutions, in the US in particular; and better uses of what might be termed smart power: humanitarian assistance, medical diplomacy, education, strategic communications and the like. This mixed picture is a good starting point for crafting the outline of a truly overarching approach for the US. Five crucial points are critical, some of which appear in this year’s National Security Strategy, largely penned by now-ousted National Security Adviser H.R. McMaster. First, we need to maintain a truly international approach to our strategy. The US cannot simply retreat behind “big beautiful walls.” The slogan America First makes some sense, but if it leads to America Alone it is foolish. Let’s coherently include our greatest national advantage -- a vast network of allies, partners and friends. We tried isolationism in the 1920s and 1930s -- how did that work out? We built tariff walls, cracked the global economy, precipitated the Great Depression, and walked away from the League of Nations -- How did that work out? You can drop a plumb line from those decisions to the rise of fascism and World War II. We can do better, but only if we stay engaged across the globe. Next, we must do better at unifying the interagency process of the US government and bringing the cabinet into the 21st century. Our agencies and cabinet departments simply do not work well together. We have Departments of Agriculture and Interior -- perfect for the 19th century, when they were founded, and still relevant -- but no one at the cabinet level looking at or overseeing technology and the cybersphere, the absolute heart of our economy. A coherent national strategy would seek to unify these disparate organs of government, and along the way place a premium on bipartisan cooperation. Third, and most importantly, our national strategy must encompass a new era of private-public cooperation. If you think about our national ability to influence events, you should visualize an iceberg -- with the tiny tip of visible ice representing what the government can accomplish. The vast mass underwater -- one-quarter of the global GDP -- is the private sector. By linking our government to the vibrant American public sector -- from the biotech belt around Boston to Silicon Valley to the innovative industrial complexes of our defense industry – we can achieve so much more. Next, we should realize that our values matter deeply, and how we communicate them must be part of our national strategy. Democracy, liberty, freedom of speech, freedom of religion, freedom of education, gender and racial equality -- we execute them imperfectly, but they are the right values. Unfortunately, we are less confident in them than we should be, and are losing ground to authoritarianism, totalitarian capitalism and outright dictatorships. The key to turning this around is our ability to construct a national focus on strategic communications -- what some have termed public diplomacy. Our values are the right ones and can compete with other systems. But too often, we cede the rich communication terrain of the internet to others. We are not in a “war of ideas;” rather, we are in what John Stuart Mill more than a century ago so aptly called a “marketplace of ideas.” Our values can compete, but not if we don’t show up on the field, and above all if we arrogantly believe that they are so powerful we don’t have to even make the case. Fifth and finally, the value of education is often underrated in our strategy. Education is at the heart of what we must accomplish, and a few strategic components here would include: cybersecurity at every level, beginning in preschool; international relations and an understanding of how the world interconnects; the study of languages; the ability to discern truth from fiction on the internet; the basics of genomics and the bio-revolution that is just ahead of us; and an appreciation for the values that are what truly makes America great. In short, there are five components that lie at the heart of what an American strategy for this century looks like: international, interagency, public-private, strategic communications, education. There are more complex layers to be added, but an approach that begins with those five elements has a reasonable chance at success. Pursing them would set us on course to achieve our ends: a peaceful, prosperous, democratic world with a secure global commons. Finally, in term of means, much of what I have described above is well within our national budget. We should look at how we allocate resources, particularly between the Defense Department and national entitlements, and consider how specific resources furthering our goals could be found. Without a grand strategy we are adrift. Let’s get underway. 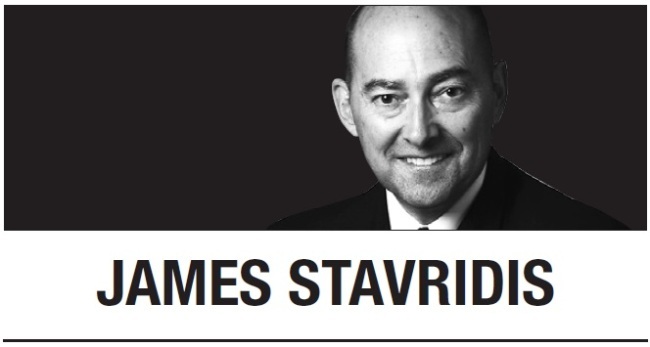 James Stavridis is a Bloomberg Opinion columnist. He is a retired US Navy admiral and former military commander of NATO, and dean emeritus of the Fletcher School of Law and Diplomacy at Tufts University. -- Ed.